It may be the end of winter, but winter is coming again before you see Season 8 of Game of Thrones. It's going to be a long, long wait. New York's Ommegang Brewery, home of Game of Thrones-themed beers, is offering a little respite from all the thumb twiddling with a new line of show-themed beers. It's not a part of the series of beers that has recently included the Winter Is Here double white ale, Fire and Blood red ale, and Bend the Knee golden ale. Instead, the four-beer series is called the Game of Thrones Royal Reserve Collection. 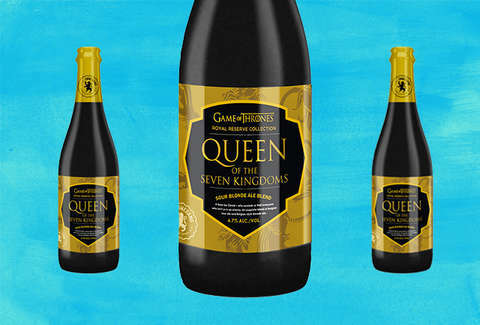 "Cersei is a complex character, and we’ve tried to emulate that profile with this beer, which blends a lovely, dry blonde ale with a subtly tart Belgian sour," brewery president Doug Campbell said in a statement. The 750 ml bottles will retail for somewhere around $12.99. Queen of the Seven Kingdoms will hit shelves in June. However, Hand of the Queen is out now, and you can track down a bottle with the brewery's beer finder tool. The next two beers in the series won't arrive until the end of 2018. Then you can debate who is coming out on top over a bottle of the Royal Reserve. It's better than staring blankly at the HBO Go home screen for the next 12 or so months.